At least 70 megabytes (MB) of available space. Browse or search for the Watchever app. 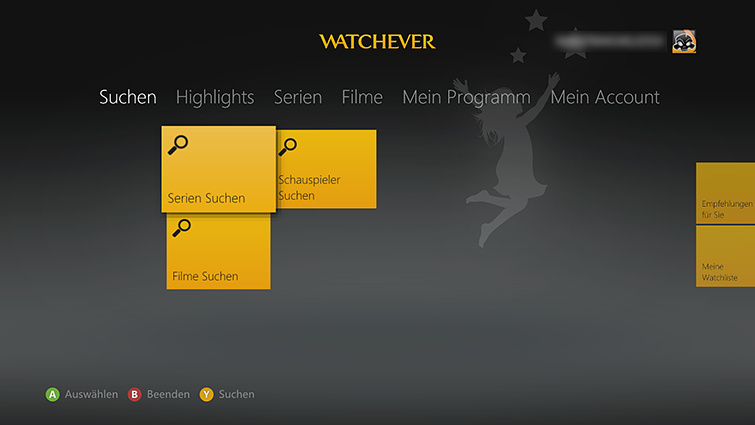 Select the Watchever app, and then select Download. To start the Watchever app later, go to apps, My Apps, and then Watchever. Go to apps, My Apps, and then Watchever. 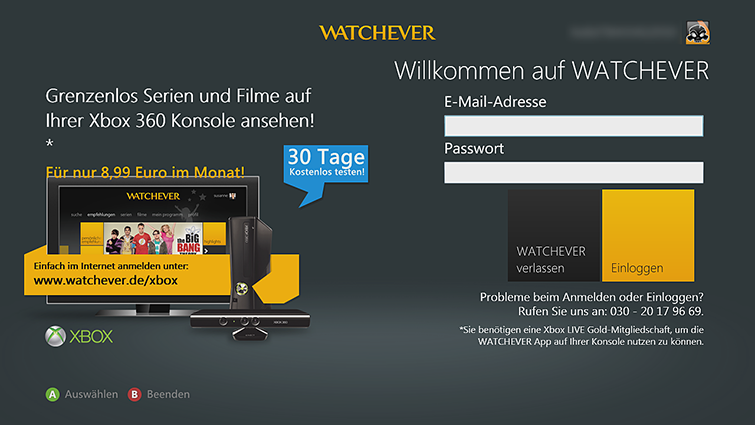 Sign in to the Watchever app using the email address and password associated with your Watchever account. 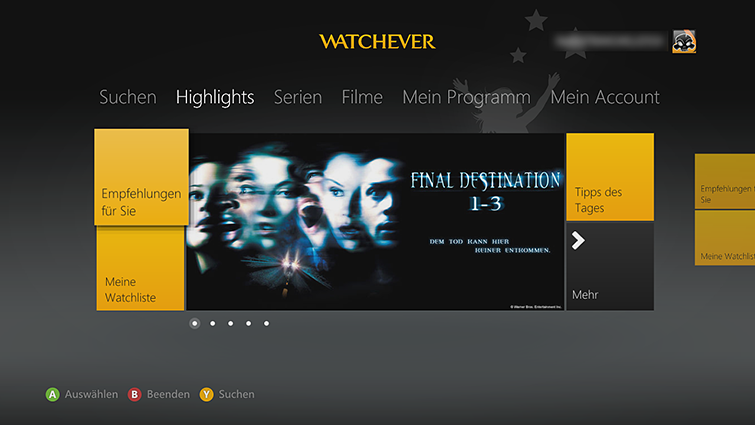 If you do not have a Watchever account, create one at Watchever. 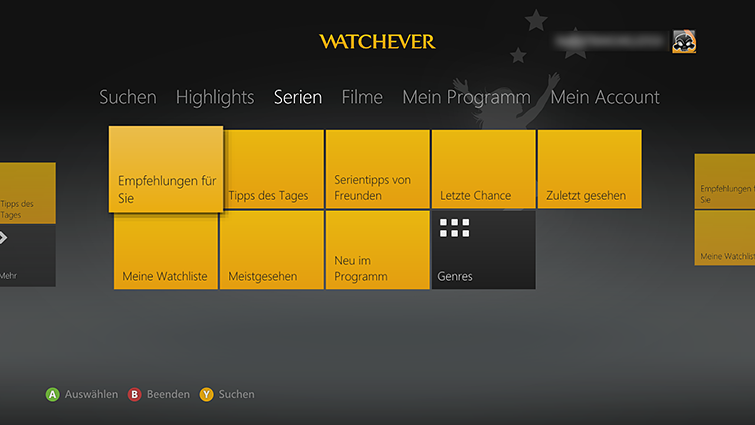 Once you have signed in, you will not be prompted to again unless you un-associate your Watchever app from your console. 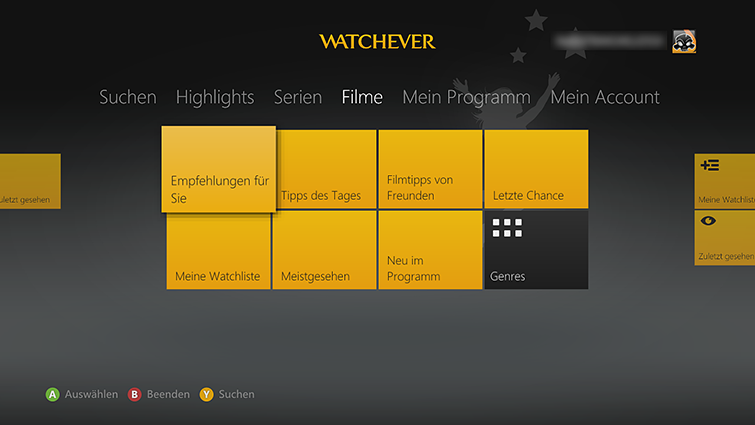 When you start Watchever, you will see the Highlights hub, where you can see the featured content in the large center tile, your personal recommendations, Meine Watchliste, suggested tips, and more. 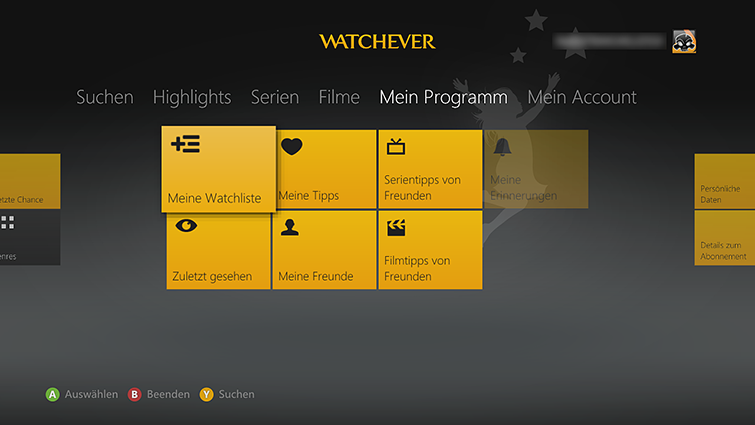 Mein Programm – This hub will be personalized based on your and your friends’ viewing. Once you have located something you want to watch, highlight it, and then press the A button. Got to the Mein Account hub in the Watchever app. You will see all of the devices you have associated to your account. Select one of the devices, and details about that device will be displayed. Once you have located the correct device, select Entfernen. 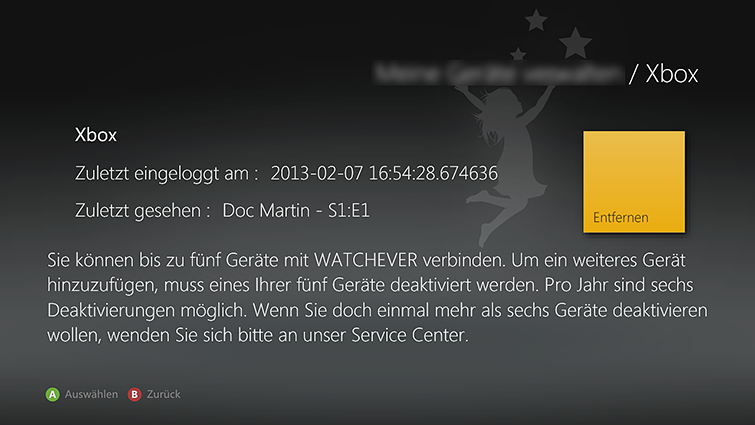 For billing and account support, contact Watchever. 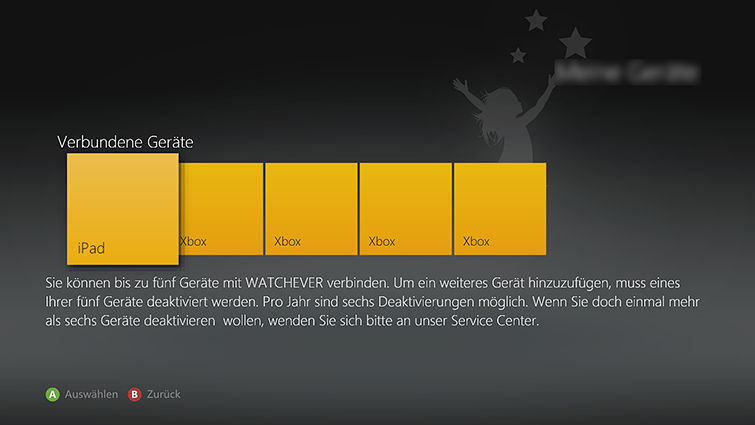 If you use Family Settings to control which movies and TV shows can be watched through Xbox Live, the Watchever app will follow these settings. For example, if you use parental controls to restrict some kinds of TV programs, those programs will be marked with a "restricted video" icon in the app. To play a restricted item, an adult must enter the Family Settings pass code. For more information about how to restrict Xbox Live content viewing by using Family Settings, see Xbox 360 console parental controls. 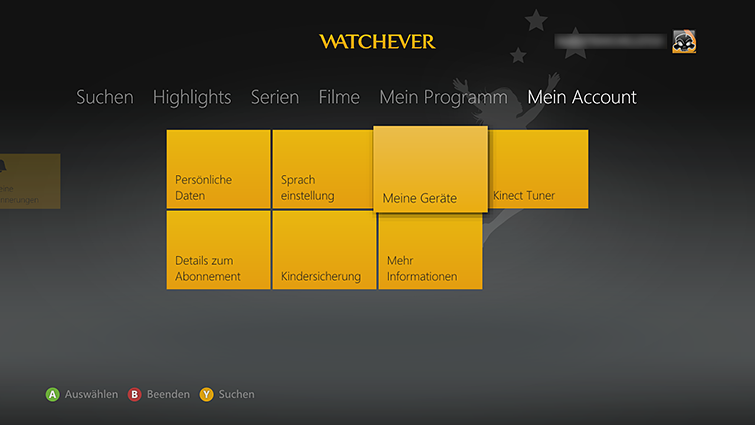 ¿Quieres contactar con el Soporte técnico con referencia al problema "Set up and use the Watchever app on Xbox 360" acerca del que estabas leyendo o con referencia a otro problema?